It’s starting. Every once in a while, there’s a brief sense that fall is peeking around the corner. The way the morning sun hits the trees, or a crisp smell of evening air. It’s not overwhelming, but there’s not doubt that before we know it, it’s going to be time for jeans, hoodies, football, apple cider and pies. I’m not one to wish time away, but after so many days close to triple digits this summer, I’m more than ready for some cooler weather. Which is why, a few weeks ago, when my Chief Culinary Consultant and I were flipping through one his mom’s old cookbooks and saw a recipe for tamale pie, I was more than excited to make it. Astonishingly enough, I have never had, much less heard of, tamale pie before we happened upon that page. I’m living in a serious shell. 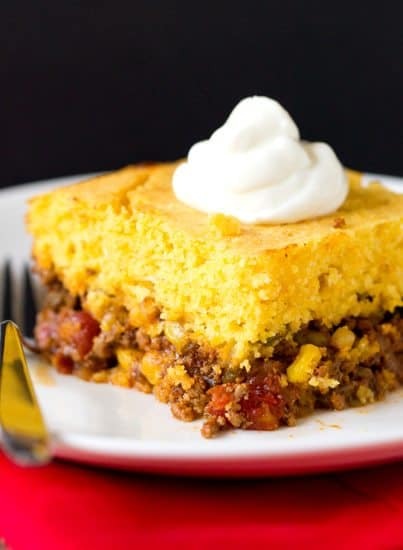 What could I possibly not love about a chili-like filling baked with a layer of cornbread on top?! It’s quite possibly the most genius dish ever invented. 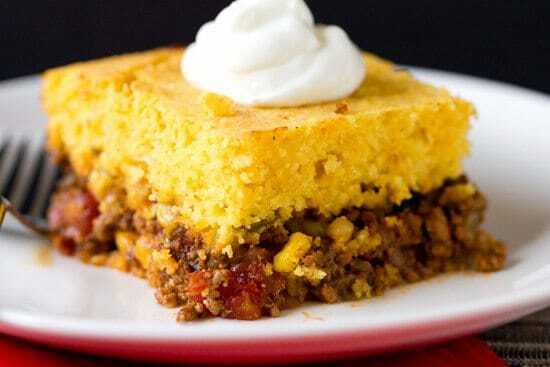 Cornbread is the perfect accompaniment to chili, which makes this recipe all the more perfect. Summer be damned, bring on the chili! I first attempted the recipe that we found in the cookbook, but the top cornbread layer ended up a complete disaster. We were able to salvage the filling and used it to make impromptu tacos. It was good, but I wasn’t in love with it. I immediately began working on round two, because the concept of the recipe was so spectacular, I knew there was a better way. In the end, I never came across a recipe that sounded like the one, so I started building my own based on my favorite flavors, ingredients and, most importantly, what was ripe in the garden! The result is one absolutely phenomenal dinner. 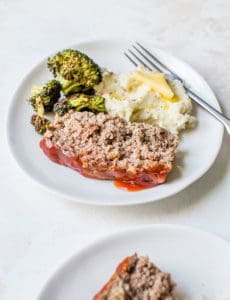 You just can’t beat all of the bright and bold flavors in the beef filling, topped off with a thick layer of cornbread. Genius and delicious. I included black olives in the recipe for two reasons: (1) they were in almost every single tamale pie recipe that I came across; and (2) my mom and Chief Culinary Consultant love them. 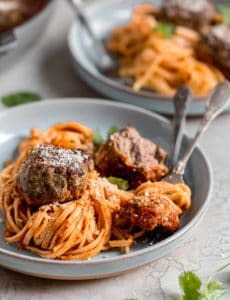 However, I personally don’t like olives (that’s putting it mildly) and think this dish would be just fine without them, so I included them as an optional ingredient. If you love ’em, add them! If you’re a fellow olive hater, you can totally leave them out. I used Monterey Jack cheese, but cheddar would also be great in this recipe, or a combination of the two. Feel free to substitute and experiment with your favorite or what you have on hand. Making the Filling: In a large skillet over medium-high heat, warm the oil until hot. Add the onion, green pepper and jalapeños, and cook, stirring occasionally, until softened, about 10 minutes. Transfer to a bowl and set aside. Reduce the heat to medium and add the ground beef to the pan. Cook, stirring occasionally to break up the meat, until browned, 5 to 10 minutes. Once the meat is browned, add the onion mixture back to the pan. Stir in the corn, diced tomatoes, tomato paste, chili powder, cumin and salt. Stir well to ensure that the spices and the tomato paste are evenly distributed. Bring to a simmer, then reduce the heat to low and simmer for 20 minutes. Remove from the heat and let stand while preparing the cornbread topping. 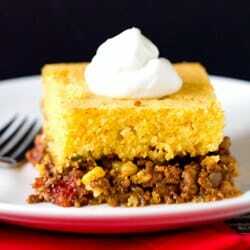 Make the Cornbread Topping: Whisk together the cornmeal, flour, sugar, baking powder and salt in a medium bowl. In a separate medium bowl, whisk together the eggs, milk and melted butter. Pour the wet ingredients over the cornmeal mixture and stir together until barely incorporated. Assemble & Bake the Pie: Stir the olives and shredded cheese into the beef mixture and pour it into a 9x13-inch baking dish, smoothing the top. Pour the cornbread batter over the filling, using a spatula to spread it into an even layer. Bake for 30 to 40 minutes, or until the top is golden brown and a knife inserted into the center comes out clean. Allow the pie to rest for 15 minutes before serving. 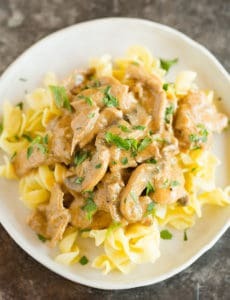 Any tips on freezing this for make-abead dinners? Should I bake it and then freeze it or freeze it with the corn bread topping still uncooked? Hi Marilyne, I’ve never tried freezing this, but I think doing so after baking it would be best; I don’t think the cornbread batter would hold up well to freezing.